Fatty Norwegian mackerel filleted, salted and pickled with vinegar. Original seasoning using sake for subtle flavour. Enough for one portion using one fillet cut into 2 slices. One fillet of fatty mackerel pickled mildly, in two pieces. Sugarlady delivers seasonal seafood to the table without spoiling their freshness or nutritional value. Macherel is packed with Omega-3 Fatty Acids as well as vitamins B2, B12 and D.
Mackerel has been shown to be effective for not only reducing the risk of heart disease, but also a preventing it due to its omega-3 fatty acids. Some researchers have found that omega-3 fatty acid are even more effective than some commonly prescribed drugs used for lowering cholesterol. Mackerel itself has many health benefits, but combined with vinegar, Shimesaba (picked mckerel) is extra healthy. Vinegar is rich in functional elements like acetic acid, caffeic acid, gallic acid, catechin, epicatechin, and more, making it an powerful antioxidant, antimicrobial, also helping reduce blood pressure and the effects of diabetes. The Japanese love Norwegian mackerel as it can contain twice as much fat as fish caught off the coasts of Japan. To defrost, take it out of the outer package, run it under cold water in the innner paclage. After thawed, wipe any juice off with paper towels, slice to your desired thickness and serve.You can enjoy these pickled mackerels right from the package, or with soy sauce and wasabi just like sashimi. It is also delicious with ground ginger and soy sauce.The rich, fatty meat also goes very well with acid sauces or marinades, using tomato or citrus as base. 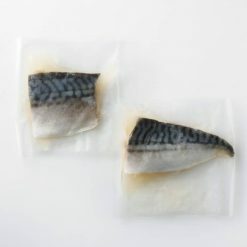 This product contains atlantic mackerel (Product of Norway), brewed vinegar, sugar, sake, salt.